Serena & Lily is having their Spring Design Event Sale now through March 25th. They have so many amazing pieces! I love their outdoor furniture, pillows & lighting. And today I found a mirror that I’m dreaming of for our front living room mantle. These pillar holders are great because of the shorter height. Sometimes I am searching for something that has a little more bulk and are lower than a tall thinner candlestick. Love these for a coffee table or dining centerpiece. You know I love my cozy pillows & throws and these have the perfect textures. 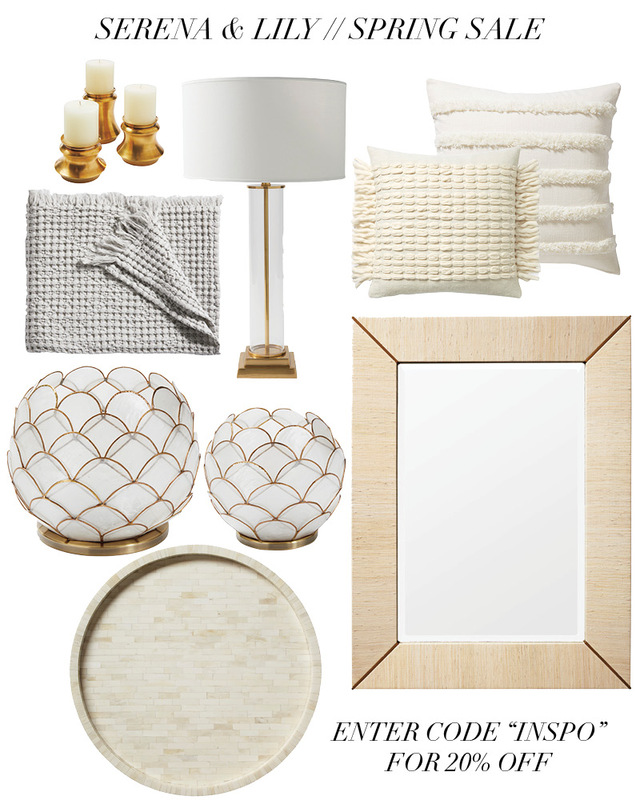 Neutral, cozy & lots of texture are what my house dreams are made of. I thought these hurricanes were unique & beautiful. Would be really pretty on an outdoor patio with some lush greens around it. Speaking of outdoor, this gorgeous bone inlay tray would be awesome on a terrace dining table. I would also use this tray on my family room ottoman or kitchen island! Serena & Lily carries such beautiful, classic & refined pieces yet they have a very casual design outlook. They are one magazine I get that I will take them time to flip through. I love how they put spaces together.